I’ve got a snow day today! It feels like a gift from the gods! Of course I will be doing some packing, but I’m also going to use it to catch up on my blog reading! and of course some knitting! 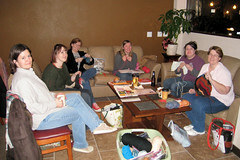 Last night the Sit n Knit group met at the coffee house / wine bar. Could there be a more perfect place for knitting? Wine or beer for those who’ve had a long day and a hot chocolate or coffee for those who want a different kind of treat. That clothes basket is full of novelty yarn that I gave away. Snap – Ok the most important issue of the day – How do you all feel about Snap, the little window that pops up with a preview of the site the link goes to? It’s a new feature from WordPress and by default it’s turned on, but I can turn it off if it’s driving y’all crazy. Love it? Hate it? Don’t care? Leave me a comment and let me know. With that out of the way, here’s what else is happening in my world. Project 365 – It’s over, at least for me. I didn’t make it a month, I am a complete and total failure. Children of Men – This is an bad movie, do not see it. Anyone who tells you they liked it has baby fever and their ovaries are aching. Or I guess if you’re into that sort of thing, see it, you might like it. I saw it Friday and I’m trying to figure out who to ask for a refund on my ticket price. Knitting – There is very little of this going on. I was busy all week and I’m working this weekend. LLP is at a stand still, the needles for Wicked are here and I may cast on this week. Books – I’m still reading The Science of Happiness by Stefan Klein and I definitely recommend it, if you’re into that sort of thing and maybe even if you’re not. My biz– I’ve been enjoying my down time after the Holiday madness. Everything is ready for taxes, and my vacation is almost over. Snow – Ugh! We got more last night, I’d say 4-6 inches after shoveling out my car and my walk this morning. Blogging – I try to do it everyday. Sometimes this hard for me, I’m thinking of cutting back. How do y’all feel about it? Is it too much work to keep with a post a day? Or is that better than cramming everything into a couple of really long posts? Maybe you’ve heard my mention my wine charm business before and wonder what it is exactly I do. I’ve finally decided to talk about it outright. I know I’ve mentioned it and the wine glass charms before, but I haven’t done a complete post about it, well because I was slightly uncomfortable. I’ve been uncomfortable trying to sell them to family and friends since I started and I sort of see my blog as the same thing. But, today I realized a couple of things: 1) I’m really proud of my business, the quality and range of wine charms I offer and the price I offer them at 2) There is nothing wrong with telling people about something you’re doing if you believe in it and I do. 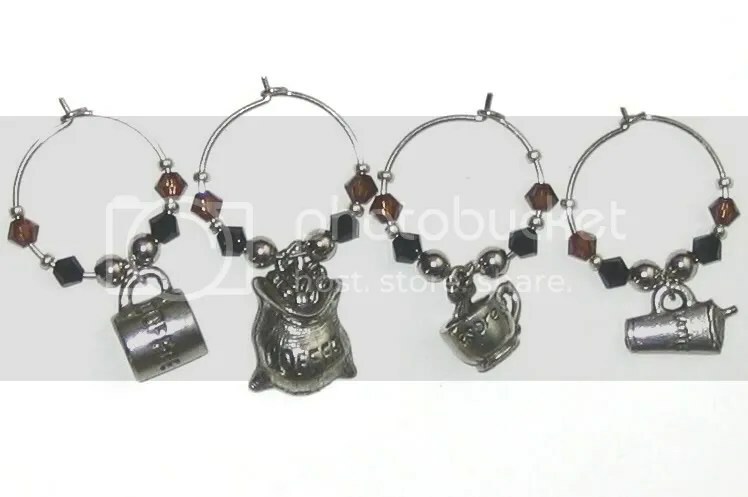 About 3 years ago I started making and selling wine glass charms on ebay. I eventually started using pewter charms for their detail and range of themes and Swarovski crystals for their sparkle. I came up with a wide range of themes for all interests. Earlier this year I opened my own online store and while I do continue to sell on ebay, my on-line store has become my primary focus. I also take custom orders for themes I don’t have listed, different colored beads, wedding and large corporate events. This time of year is especially busy because the wide range of themes I offer allow people to select a set that matches the interests of the person they are shopping for. So if you’re looking for the perfect gift for someone on your gift list take a look at my wine glass charms! It’s started! For some reason all during October I think I have alllllll this time to get xmas presents made and decided on. But somehow November creeps up on me and as soon as I turn the calender I feel it, the panic! There is NOT enough time to get everything done! I have so much to knit, things to shop for, goodies to make and my wine charmbusiness! The biz just gets crazy! Things are steady all year then start picking up in October, increase rapidly through November, then snowball out of control after Thanksgiving. Everyone thinks they can wait to the last minute to order online presents. Never-mind that everyone else is doing the same thing and that First Class mail from the postal service often takes less than a week during other times of the year can now take FOUR! In other news! Here’s some unfinished knitting projects. Most of them are destined to be xmas gifts. Except Fetching, those are for me. I need to get the thumb re-knit so I can at least take it off the needles and declare one thumb done. No idea when I’ll have time to do that. I’m trying to figure out why it came back to me me when I see it says “Bad Meter Date” , so I look at the date, yeah it’s from December. I investigate, turns out it’s the package. Now I turned in a claim for this at the post office and never heard anything about it, not even one phone call. Now, 6 months later someone finds it in the bottom of a box or something and sends it back to me based on the date? Come on! But what are you gonna do? My packages are too small for UPS, so I’m stuck with the postal service. I finally developed a blog button or Logo for my wine glass charm business. Please, please, please steal it. Post it everywhere! I am shameless! The next couple of months are going to be very hectic. The Wedding: My sister is getting married in September, which means between now and then there is a bachelorette party, showers, dress fittings, last minute preparations and a mad attempt to loose 30 pounds before the wedding (on my part, not hers, she looks fab!). The House: I’ve come to the realization that home ownership is not for me. I’d rather spend my spare time doing other things and I don’t deal well with stress. Everything little thing that might go wrong really bothers me. The other night I thought the stove wasn’t working (its fine) but I was all worried about how I would afford a new one. And as Kevin likes to point out, I worry too much. It’s true I accept it, it’s just how I am, and I’d rather have someone else deal with those thing so that my biggest worry will be locating the landlords phone number. So, I’m going to be finishing some projects around the house so I can sell it and move back into an apartment. The Move: Kevin graduated with his MLS in May and is looking for a job, soon he’ll find one and be moving, it’s just a matter of how far. While I’m very happy for him and I know he’ll find a job he likes and hopefully live somewhere very cool, so I can visit, I am going to be sad he’s not here. Please don’t ask me what I’m gonna do when he’s gone, I’m trying to enjoy him being here now and I’ll deal with that when it happens. (yes, I love Scarlett O’Hara and she was right about dealing with it tomorrow). The Business: I’ll be gearing up for the Christmas season. Sounds too early I know, but I do probably 80% of my wine glass charm business at Christmas and I have vowed to start preparing early this year so that I can be slightly less crazed and maybe actually have some time to bake cookies. Hopefully somewhere between all that I’ll find some to knit and read.